hether we roast a chicken or make pork tenderloin, we only use small portion of sage leaves we bought at grocery. We used to plant the leftover stems, only to gain even more! (They grow fast). I never tried frying sage until recently, but it's actually very tasty. Now we need to buy (or grow) more! Pick the leaves of sage with stems on. Make sure they are not wet. In a small pan, heat 1/8 inch of olive oil over medium heat. Fry the sage leaves in the pan, dropping one by one. 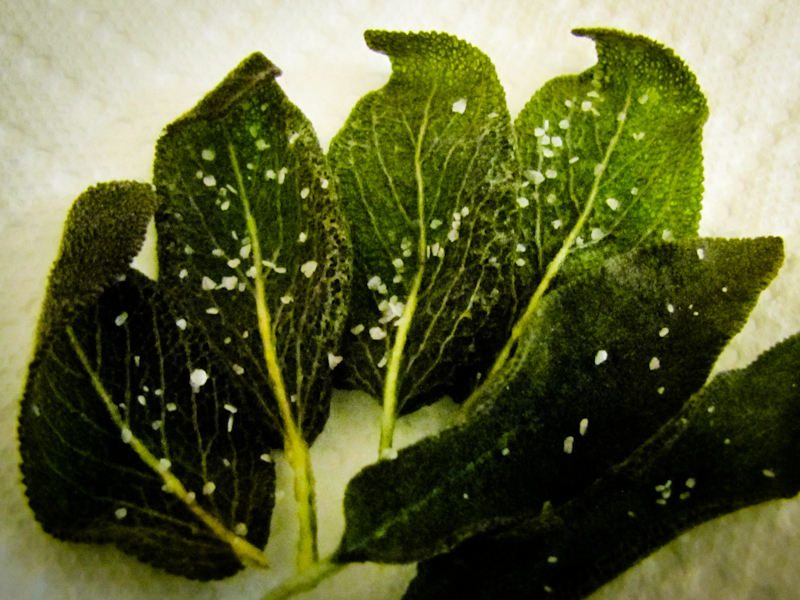 When the leaves get crispier, pick them up to drain the oil over the paper towel on a plate. Sprinkle salt.